We happily consult on a range of projects, especially if they are unusual, challenging, and require innovation or re-invention ~ and offer us the opportunity to collaborate with interesting people who want to do good work. Beginning with the Kennedy Center’s JFK Centennial, Elena Park is an Artistic Consultant for the nation’s performing arts center; for its current season, presented with National Geographic, she is curating talks around the themes of The Human Journey: migration, identity, resilience, and exploration. 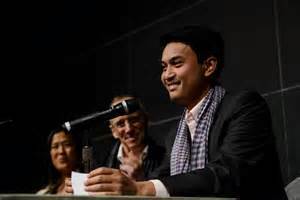 While working with the NGO Cambodian Living Arts, she helped to conceive Season of Cambodia (SOC), an ambitious, multi-disciplinary festival in Spring 2013 showcasing Cambodian arts and culture in partnership with 34 NYC venues, from artist residencies to performances and exhibitions. More recently, she was project advisor for Bangsokol, the first Requiem to honor the victims and survivors of the Khmer Rouge; the multimedia piece premiered at the Melbourne International Festival in the fall of 2017. Prior to the BAM run, she worked with the Asia Society to produce a panel including filmmaker Rithy Panh and CLA's Phloeun Prim with Angelina Jolie and Loung Ung (director and writer of the film, First They Killed My Father), moderated by Ford Foundation president Darren Walker. In February 2016, we served as Consulting HD Producer for Kanye West's Adidas YEEZY show (above) ~ the first time a fashion launch was shared live via satellite with a global audience. The NYC event was broadcast in real time to North America, Europe, Eastern Europe, Russia, and Australia, with Kanye fans across nine time zones joining celebrities such as Beyonce, Jay-Z, Rihanna, and Anna Wintour, who gathered in a raw space at Clarkson Square. Though she actively avoids committees, Elena is pleased (proud, even) to serve on the Artistic Advisory Committee of On Site Opera and as the Chair of National Sawdust's Advisory Board. She was part of the Strategy Committee of the PROTOTYPE festival for its first five years.